Perfect audio equipment for a classroom. 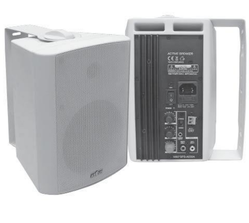 With 30W (RMS) on each Speaker it gives a crystal clear sound for classroom - be it the lecture voice or multimedia output. Quick mounting feature included. Adjustable mount to cover equal sound output anywhere you need. Looking for Portable Speakers ?